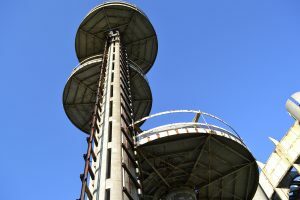 The 50th anniversary of the World’s Fair in Queens has sparked calls to restore the New York State Pavilion—and a rush to document perhaps the city’s most famous ruin for posterity. Researchers from the University of Central Florida will trek to the landmark in Flushing Meadows-Corona Park next week to create a three-dimensional scan of the pavilion, from its uneven floors to its deteriorating walls. “It is really important for future generations to have an understanding of what it looked like in its most minute detail 50 years after the fair,” said Lori Walters, a history professor who will be scanning the pavilion with two colleagues from June 2 to June 6. Rarely do dormant buildings survive as long as the pavilion has in real-estate-starved New York City, where older structures are often demolished to make way for apartments, offices and stores. Situated in a city park, the abandoned pavilion has eluded developers and remained a constant in an ever-changing cityscape. The structure probably won’t stay like that much longer. A city study last year reported that demolishing the pavilion would cost $14 million, far less than the $52 million price for restoration. But the fair’s 50th anniversary this spring has generated media coverage, public interest and political promises to rehab the structure. “It tells a moment in the history of New York,” Dr. Walters said. To document the pavilion’s ruinous state, the researchers will place high-speed 3-D laser scanners, each about the size of a football, atop tripods around the structure. Dr. Walters plans to stitch together about 50 to 60 images, with scanning lasting as long as half an hour in some parts, to capture the detail of the pavilion. 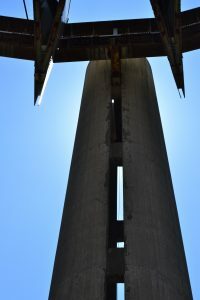 The researchers won’t be allowed to ascend the towers, which were once accessible by elevators that have since been stripped from their cables and stairs now so worn that they are treacherous to climb. Instead the towers, which are 60, 150 and 226 feet tall, will be scanned from the ground. The scans will be stored in an archive for posterity and posted online to create a virtual tour, Dr. Walters said. Relatively few buildings have been preserved in such novel fashion. Digital scanning was championed in recent years by the California nonprofit group CyArk, which has scanned more than 130 historic sites on all seven continents since its inception in 2003, according to its chief technology advocate, Justin Barton. Conflict and severe weather threaten many landmarks documented by CyArk. Mount Rushmore, which is subject to cyclical freeze and thaw, was scanned in case “a portion of a nose or an ear or something” falls off, Dr. Walters said. The university researchers are prepared to scan the pavilion by themselves, but CyArk is running an online fundraising campaign that would allow Mr. Barton to accompany Dr. Walters’s crew should the group reach its $15,000 goal by June 1. The pavilion would be among the youngest buildings in CyArk’s archive, which includes sites in ancient Egypt, Greece and Italy. Mr. Barton noted the urgency of scanning the pavilion. While New Yorkers once considered their city and its landmarks immune from the most destructive natural disasters, a violent storm ripped the wooden steeple off a historic church in Flushing, Queens, in 2010, and superstorm Sandy ravaged Ellis Island in 2012. Preservationist Mitch Silverstein, who has been repainting the pavilion with other volunteers for the past five years, said he believes the digital scans will preserve the look of the building just before its renaissance. Matthew Silva, a preservation advocate and aspiring filmmaker who teaches technology at Jericho Middle School on Long Island, said he would take his eighth-grade students to meet the researchers at the pavilion.